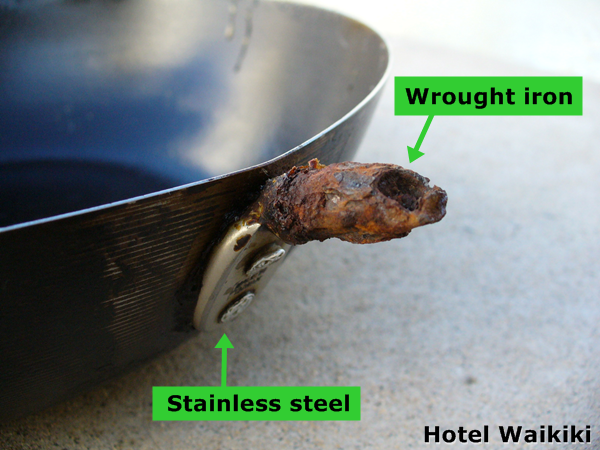 I've owned this wok for many many years already but unfortunately Mr. Wok cannot handle his duties anymore. "Handle" .... I bet you missed that. At any rate, the bamboo handle developed a fissure about a year ago, and as washing water got into the fissure, the wood fibers started to swell apart, and as the wood fibers swelled, the fissure only got larger and more water leaked into the hull, and so forth. Didn't pay much attention to that fact, since the flatten out part of the bolt where the bolt or tang is riveted to the side of the wok, is stainless steel. I think the riveted part is a known as a flange. How in the tarnation does a bolt, or at least its shaft, turn into wrought iron while it's flange is visibly stainless steel? Also, you've seen those anodized woks. They're all for nought. This wok is the way a wok should be. Its walls are thin to give you more control of the heat. Lift it off the gas burner and it starts to cool immediately. Turn up the flame and it distributes the heat instantly. Granted this particular wok isn't the authentic carbon steel versions that a tradesman hammered for hours into shape but it has or had everything else going for it. Ummm... this is the Ala Wai water with the flesh eating disease? Kay- no start a rumor like dat. You're right about not catching the "handle" part. 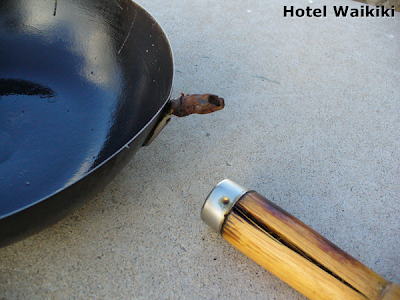 At first I thought, hey, what's that half a nunchuck doing next to the wok? We bought an electric wok from Walmart a few years ago. Cooks like a dream. Got a picture of the tilapia on the label? Rowena- nunchucks! 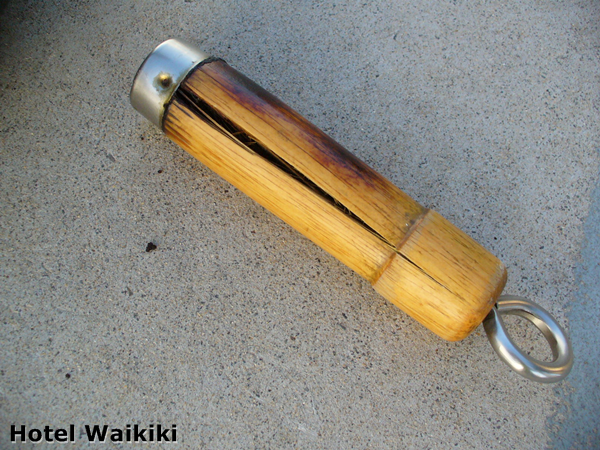 Now that's an idea on how to recycle the bamboo. gigi- with me, I have to cook with gas. Haven't used an electric stove for eons already. Nate- not, "talapia." It's Hawaiian salmon.